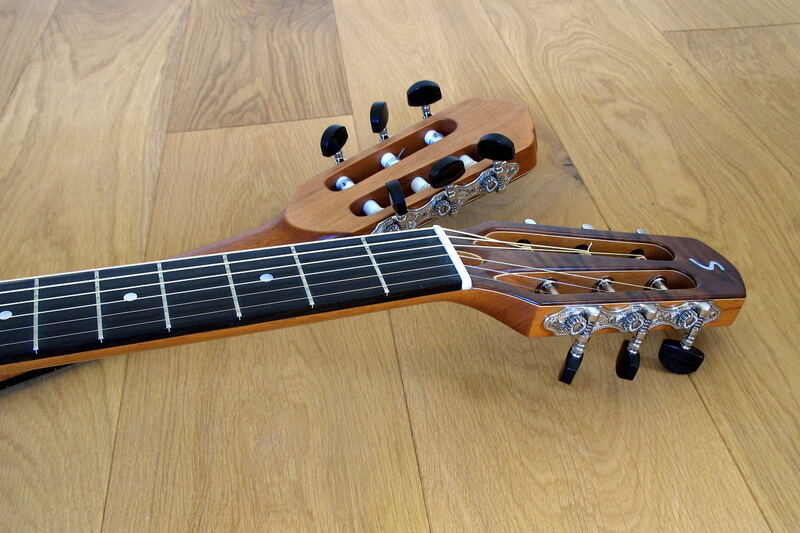 This double neck guitar works! 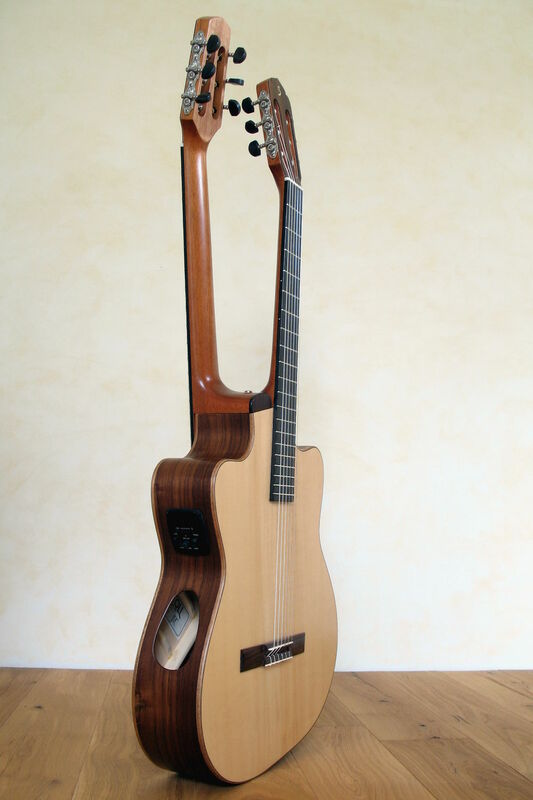 Nylons string and steel string guitar in just one instrument with perfect ergonomics, comfortable handling and full sound range. 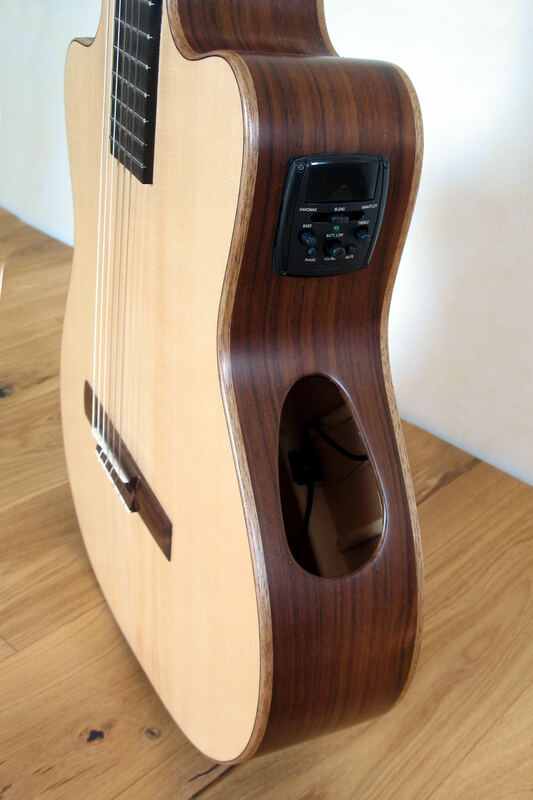 This is unique. 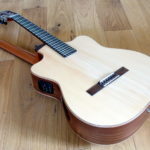 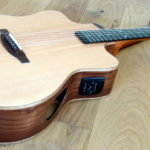 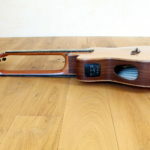 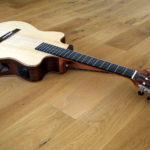 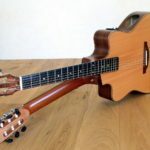 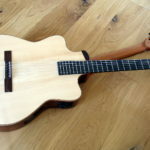 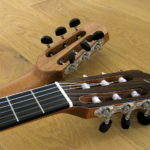 How often the dream of a guitar, playable with steel strings and nylon strings at the same time, was realised without taking into account the physical and technical requirements of lutherie? 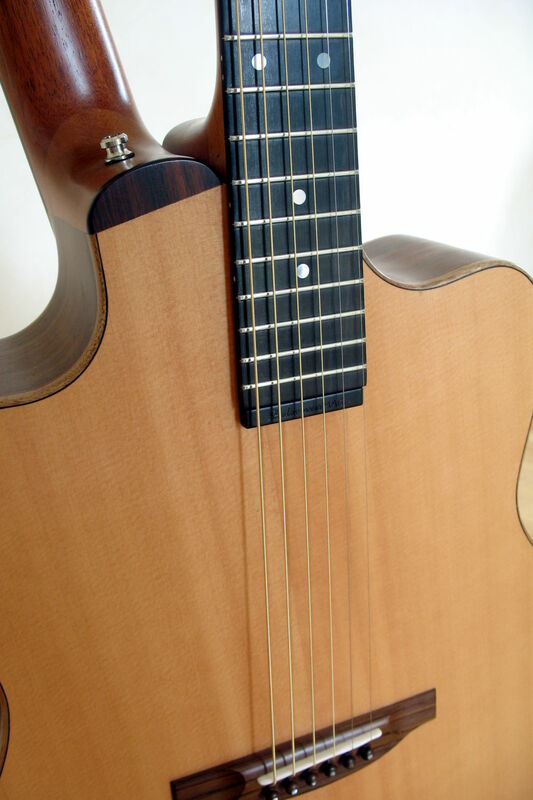 The reversible double-neck guitar Double Fun spares the back and thus is equipped with two tops. 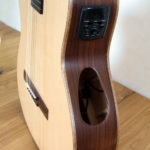 The necks are applied back to back. 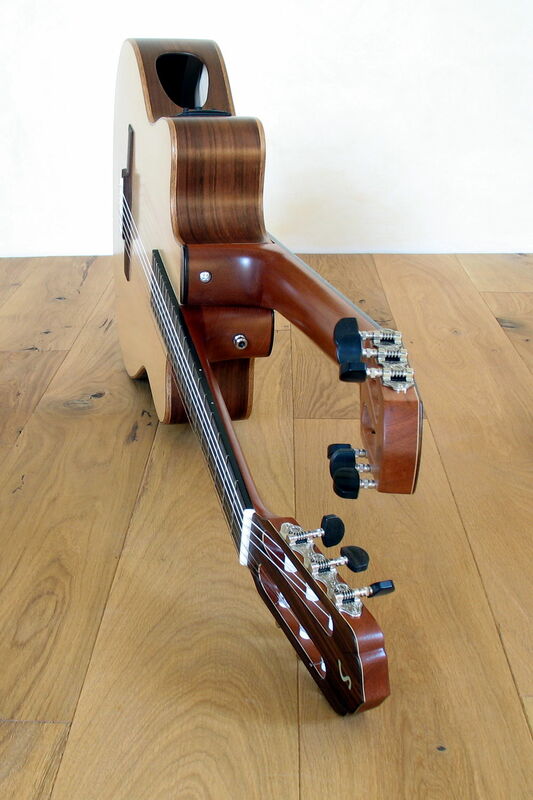 This way they can be located on each side in the same position, namely where the neck of a "normal" guitar would be. 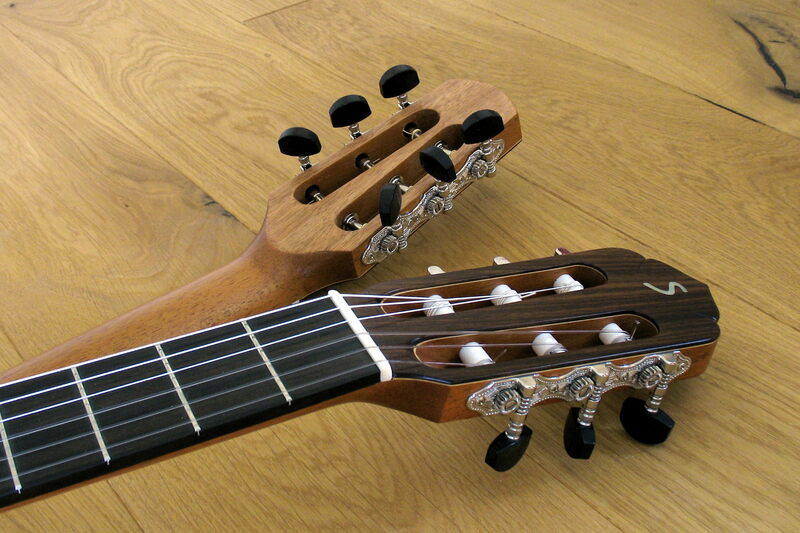 Two individually braced tops ensure optimum sound for steel and nylon strings or whatever combination is desired. 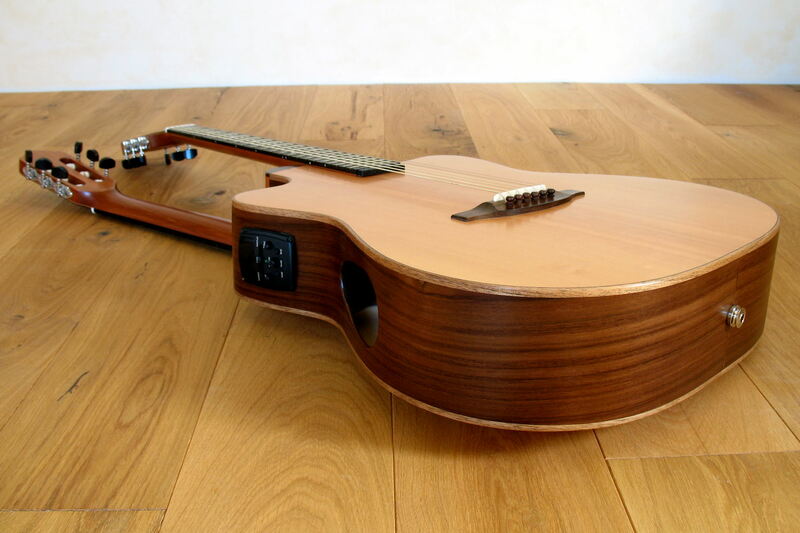 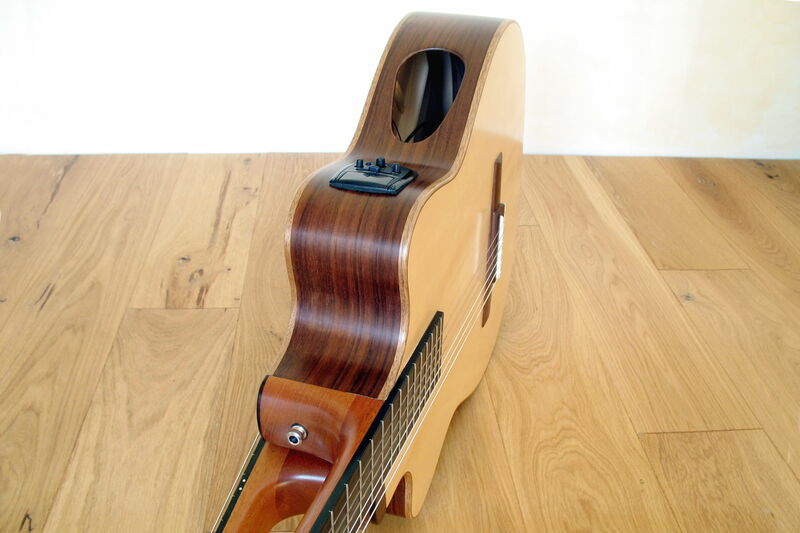 The body shape of a single-necked guitar was almost kept with this construction. 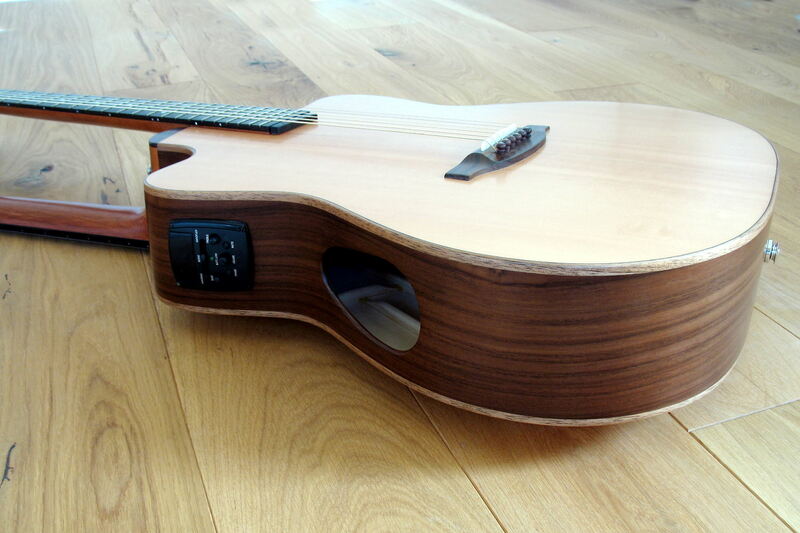 Only a slight enlargement in the upper bout was needed to apply the necks staggered and thus ergonomically. 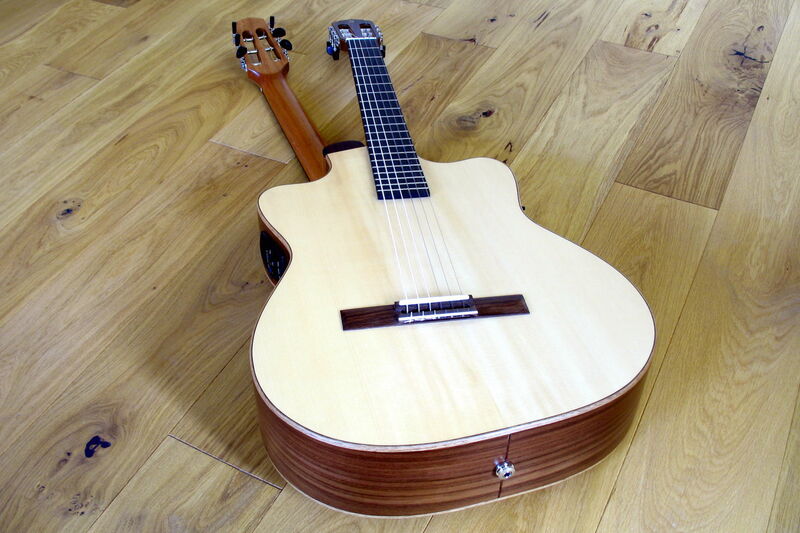 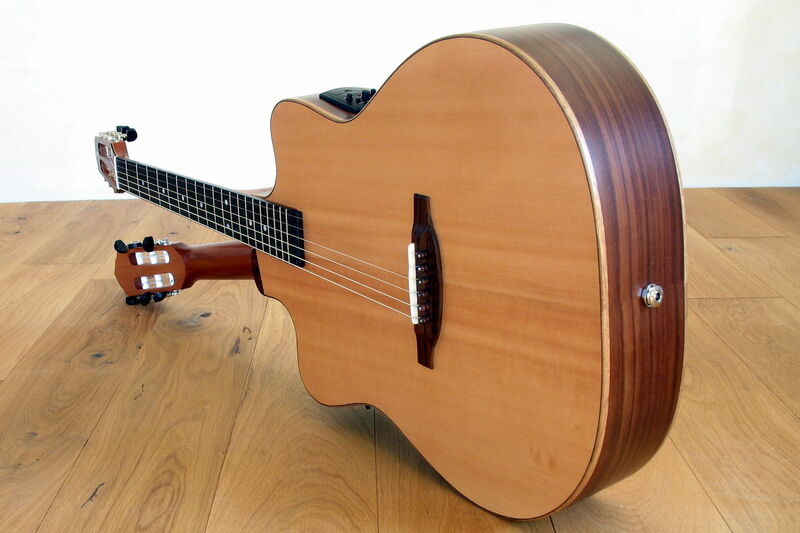 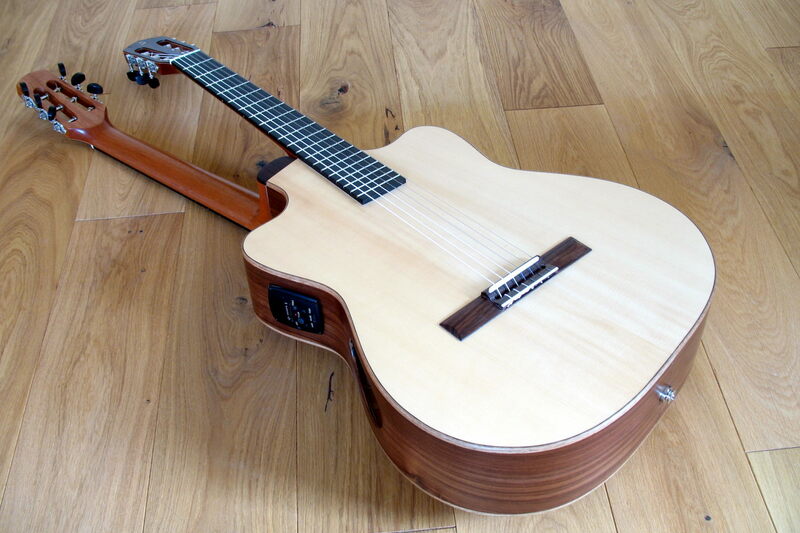 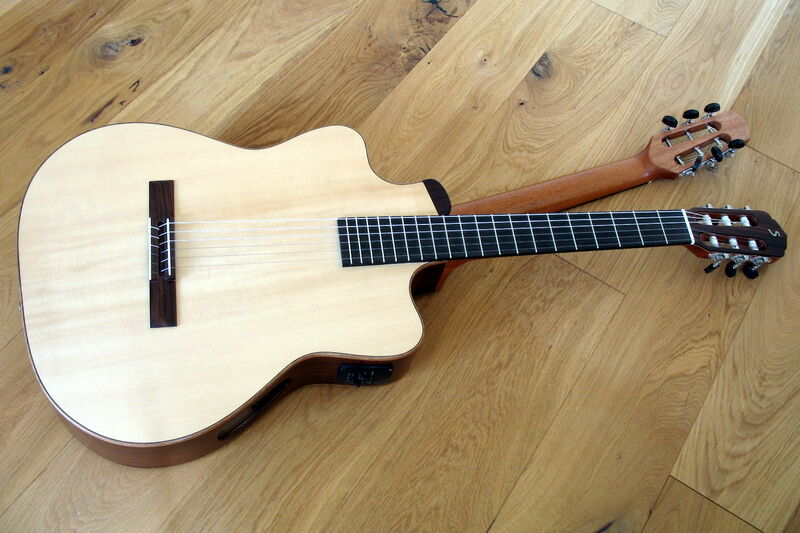 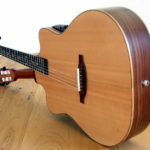 Both sides have Spruce tops, on the classical side Engelmann Spruce, on the western side Sitka Spruce. 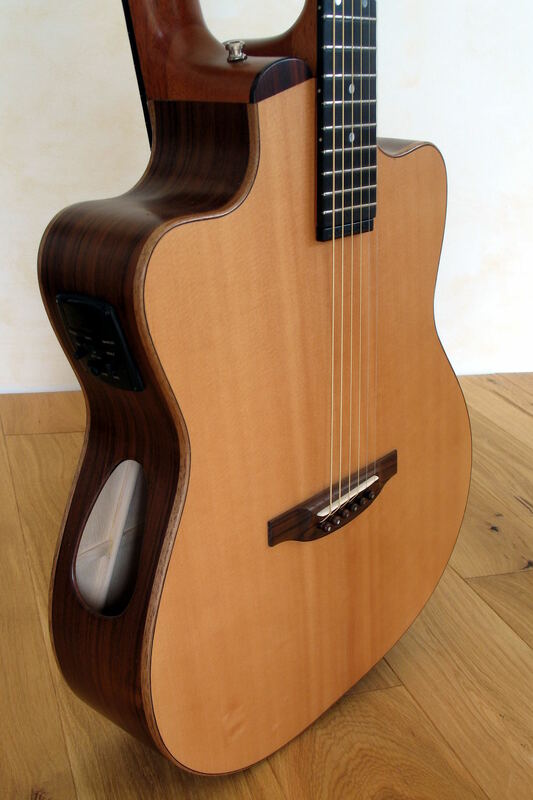 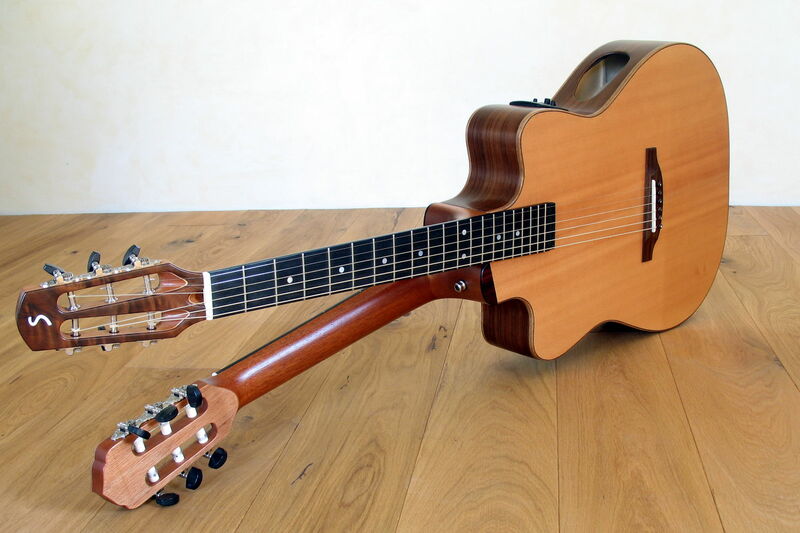 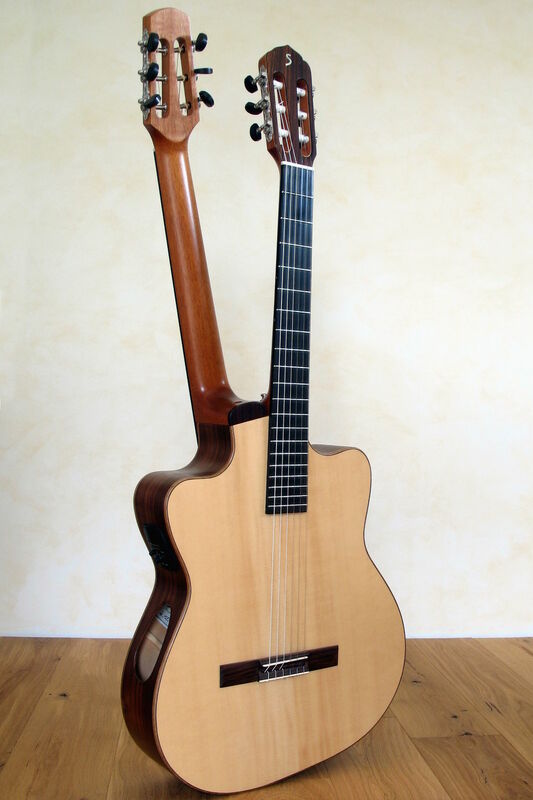 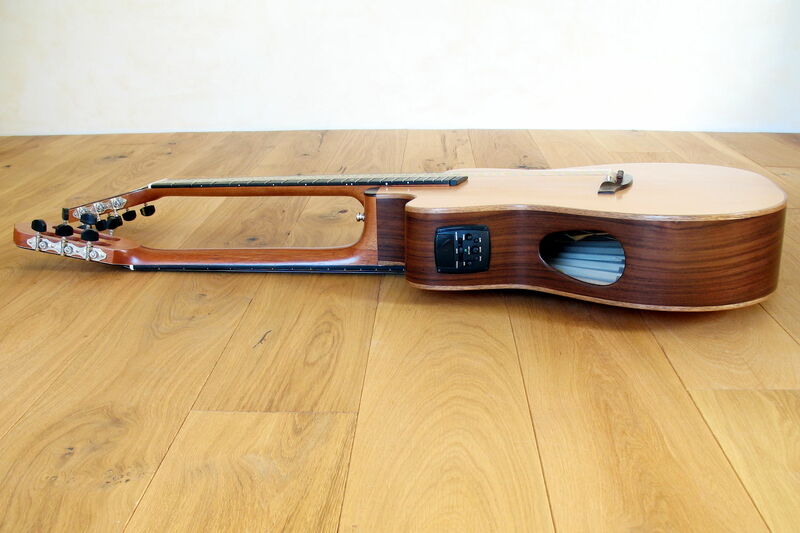 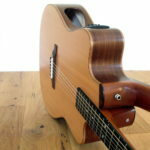 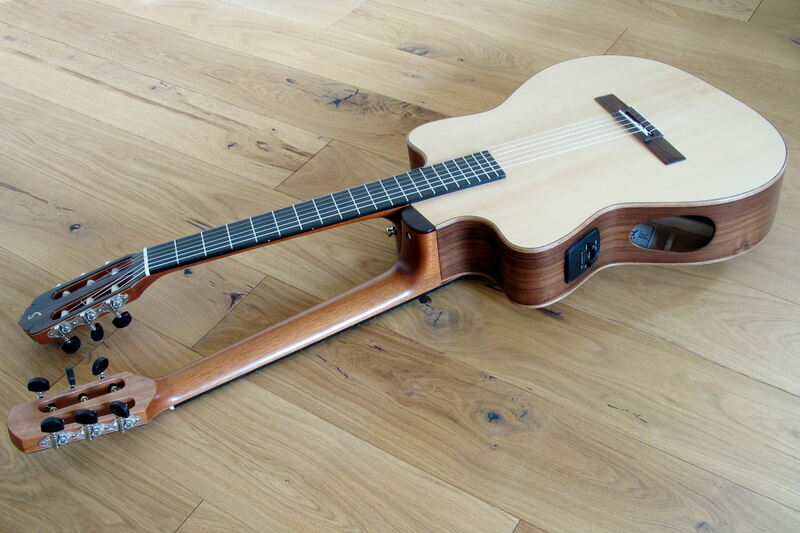 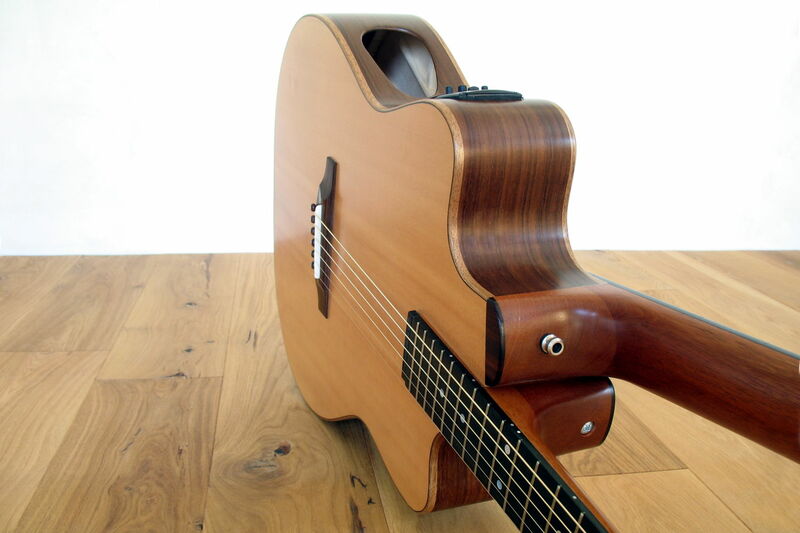 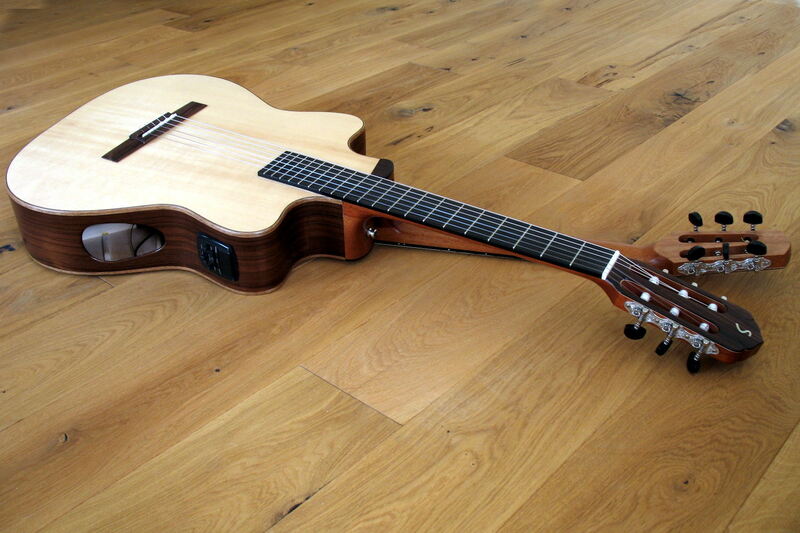 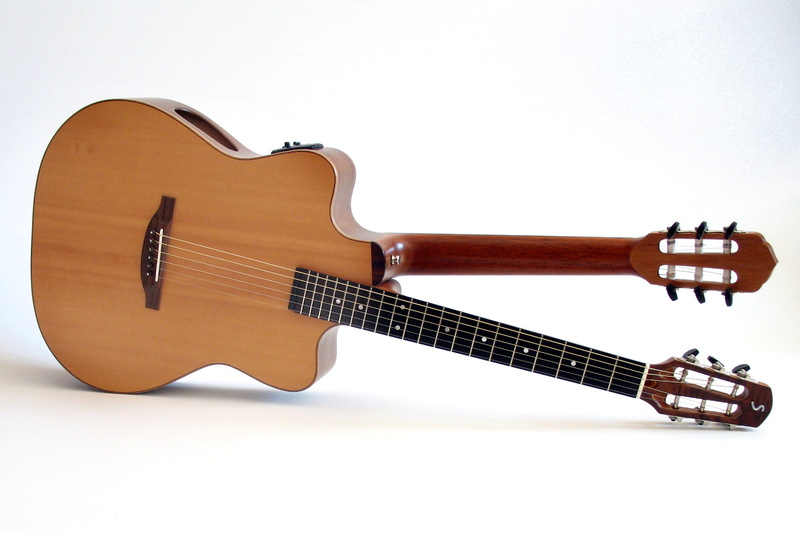 With the reversible guitar Double Fun, the body-facing side takes over the function of the back. 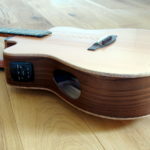 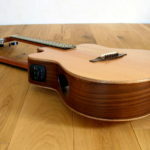 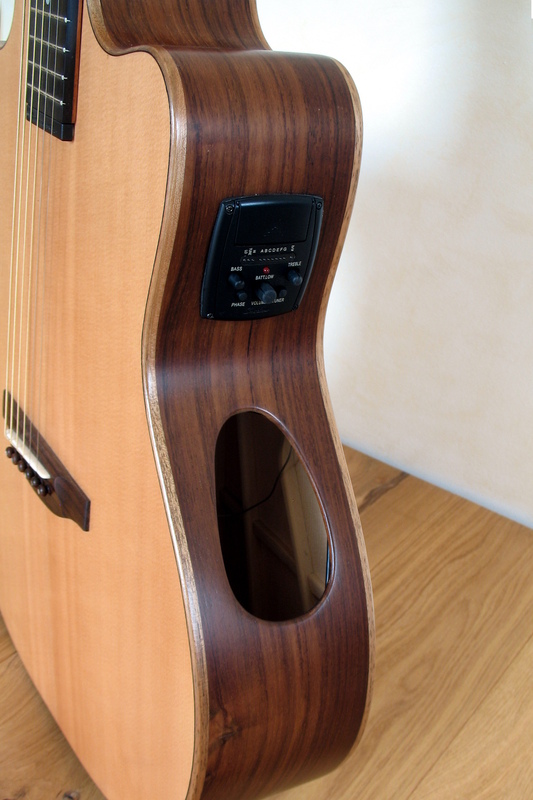 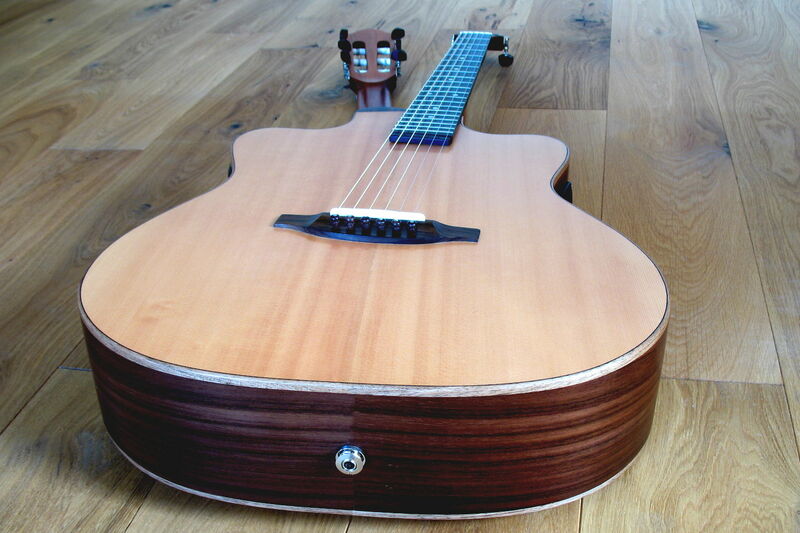 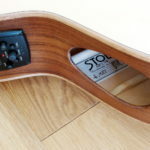 For this reason the sound holes have been positioned in the sides. 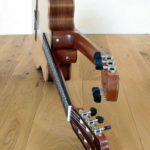 On each side there is also an equaliser. 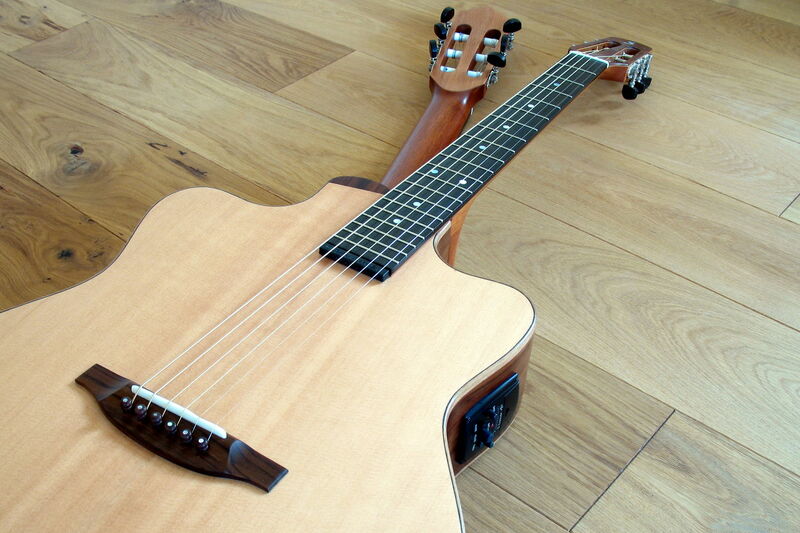 For amplification, we have chosen two pickups by Shadow. 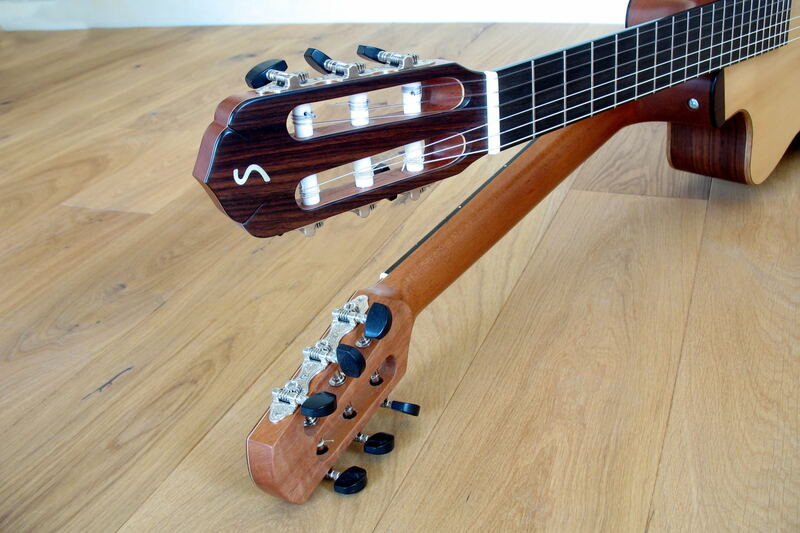 SH Performer Double Play for steel strings side and SH Performer Tuner for the classic side. 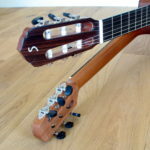 The two pickups, however, are connected to one single endpin jack, but with separated signals to provide output to two different amplifiers or channels in the mixer. 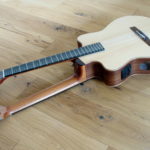 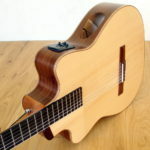 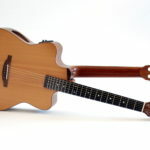 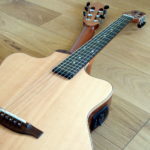 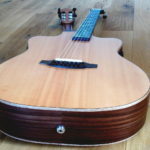 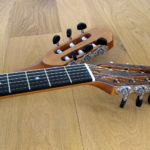 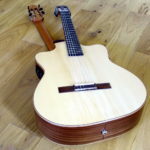 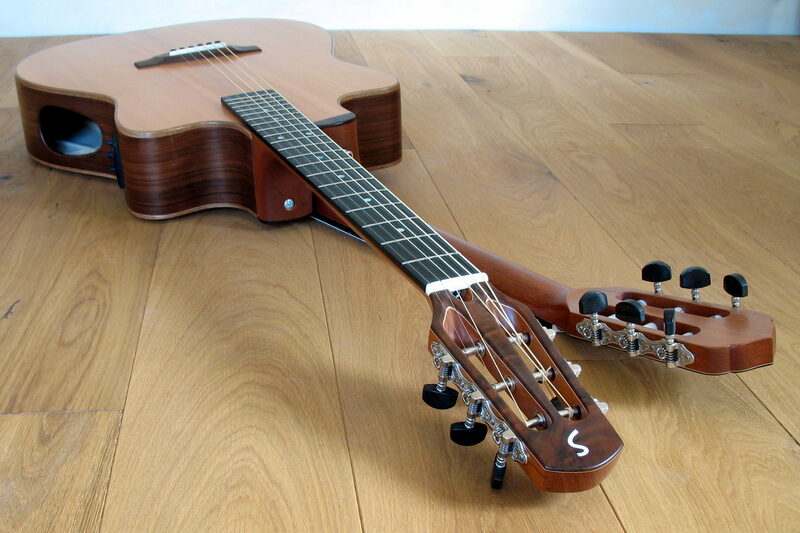 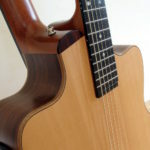 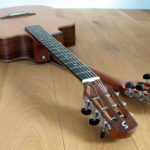 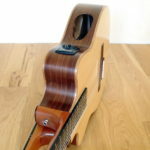 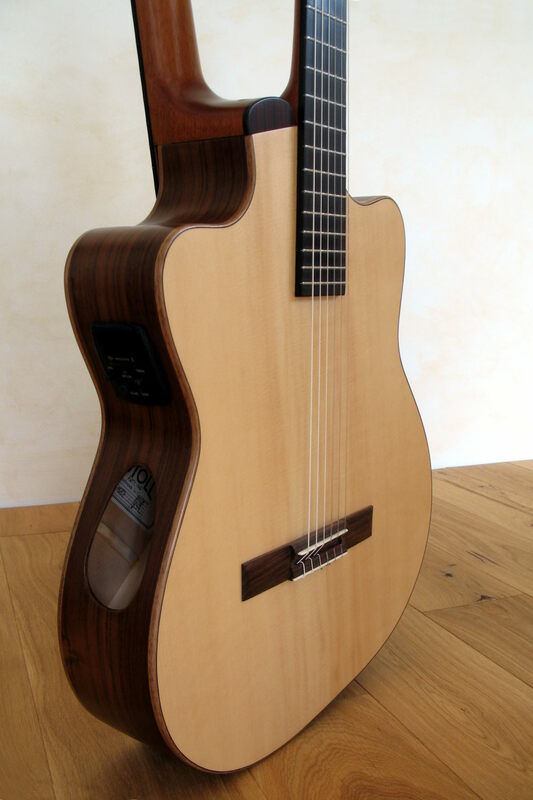 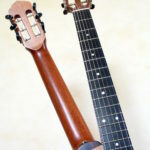 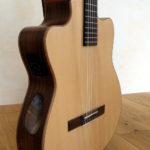 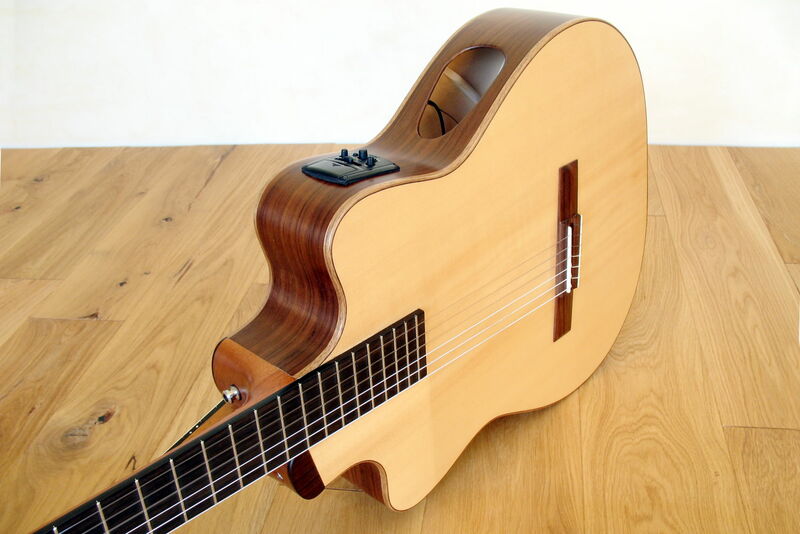 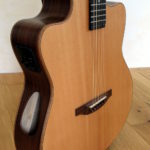 The Cedro necks with Ebony fingerboards both merge into slotted headstocks, which on one hand are lighter and thus prevent the heads from tilting downwards. 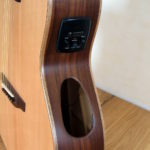 On the other hand the backward facing buttons allow for comfortable tuning. 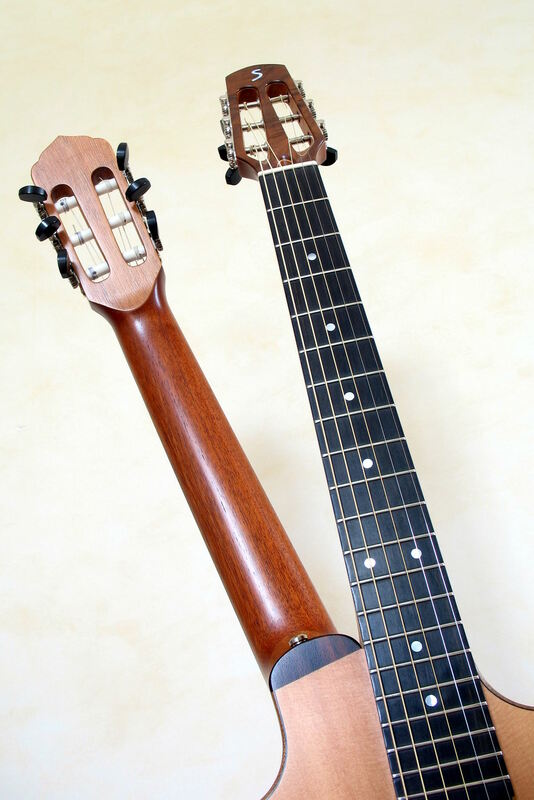 This double-neck guitar is played best while standing and using a strap. 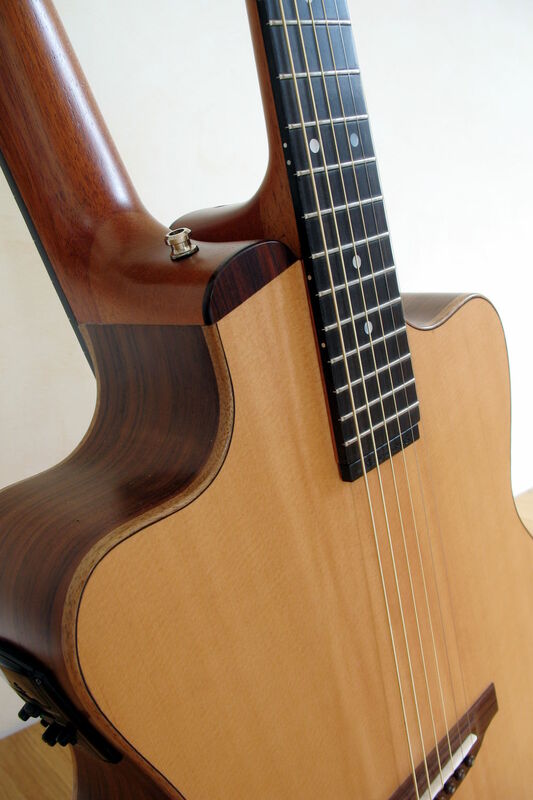 By gently lifting and turning the guitar around by the longitudinal axis, switching sides is easy to achieve. 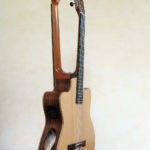 One can even change within one piece. 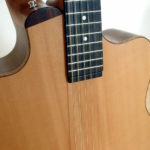 The sound? 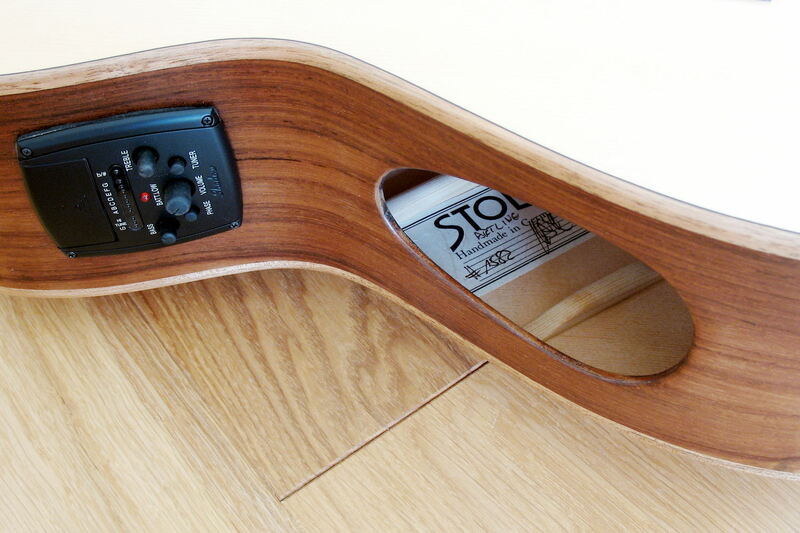 Stoll as usual. 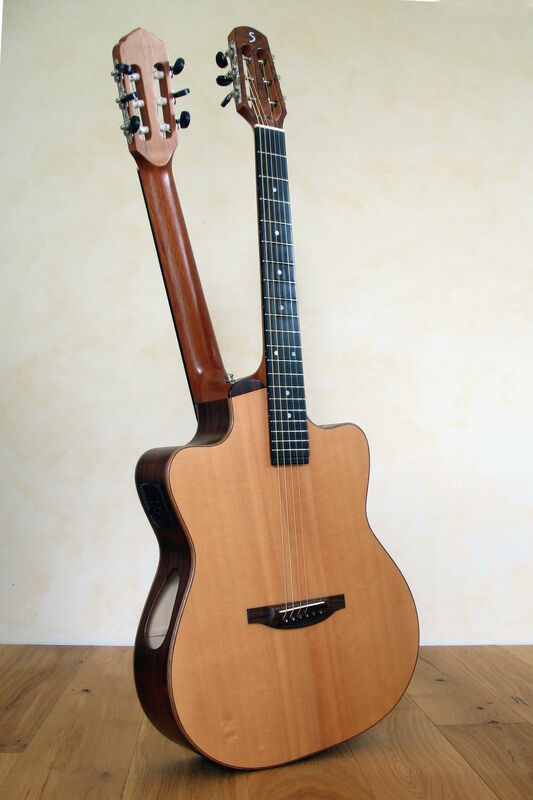 Possible Combinations: 12 / 6 steel strings, fretted/fretless, guitar/bass etc.